Most spouses aren't officially on the payroll, but they can play a huge role in the work life of their entrepreneurial partners. After all, it's often your spouse who knows you best. He or she can provide perspective for your overly optimistic projections, support you through a gutsy decision or help develop your communication and leadership skills. "Spouses can be invaluable coaches or counselors because they are not absorbed into the same universe and speak from a more balanced perspective," says Marion McCollom Hampton, senior partner at Cambridge Advisors to Family Enterprise. But it's important to nurture the spouse-entrepreneur relationship and to avoid making too many demands, McCollum Hampton adds. "The spouse often experiences the entrepreneur's business as a rival for his or her time and attention." Not sure how your spouse can help? Consider the experiences of three entrepreneurs who have received valuable support from their partners. Leaving the Manhattan publishing scene to open his dream store in South Orange, N.J., felt like a risky career move for Ben Salmon. But three and a half years later, he's glad he made the change. "I get to live in small-town America with urban hip New Yorkers," says Salmon, 30, whose store has carried more than 8,000 items and twice been voted the best kitchenware store in the state by New Jersey Monthly magazine's readers. Sales have increased 60 percent over the past three years. Salmon attributes part of his success to his wife Emily Cooper, 31, who supports his business decisions--even when he's wrong. For example, a nautical-themed summer display last year didn't pan out, and some items are still on the clearance shelf. Salmon leans on Cooper when he makes such mistakes because he needs a dose of optimism. "If she second-guessed my retail instincts," he says, "the store would not be as strong as it is." For the spouse, it can be difficult to help the business owner deal with disappointment. "I don't always know how to help him," Cooper says. Salmon considered it important to get his wife's unwavering support before he took the entrepreneurial leap. Before he started the shop, he presented Cooper with a 22-page, single-spaced business plan. "I wanted her to know I was serious," he says. "Without her endorsement, I don't think I could do it." It's easy to assume your spouse can do everything you do for your business. But turning to your spouse in a pinch can backfire, says Salmon, who soon realized his schoolteacher wife wasn't meant to work the cash register. "She'd key things in wrong, accidentally bag things that the customer didn't buy and accidentally not bag things the customer did buy," says Salmon, who now has three employees. Admittedly, Cooper says, cooking is not her forte. "I don't know the product very well at all," she says. "We joke that all I know how to cook is things out of a can or a box." When Sandra Oh Lin. 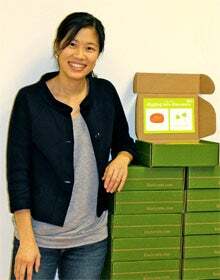 37, started Kiwi Crate Inc. last October, she knew her husband Kenneth's expertise in healthcare startups would help her Mountain View, Calif.-based business. But she's turning to her spouse even more than she expected for advice about her subscription service, which provides activity boxes for kids. With only seven full-time employees, it's critical that Kiwi Crate make the right hires, and Kenneth has helped his wife pick people who fit the company's culture, she says. During the hiring process, Lin informally uses her husband as a sounding board to "talk through" decisions related to human resources, such as which compensation package she plans to offer and how to attract the best talent. "He's not a gating factor, nor an interviewer," she says. "He simply helps to reinforce my conviction around valuing good people and compensating them appropriately." His insights about building a team are especially helpful, Lin adds, because he knows her strengths and weaknesses. But Lin is careful not to rely solely on Kenneth for advice. Before making decisions, she also speaks with others who have launched startups. Still, Kenneth feels he's being heard. "I have yet to run into a situation with Sandra where something that I feel very strongly about is not seriously weighed and considered," he says. Lin believes it's essential for entrepreneurs to acknowledge their appreciation for their spouse's counseling and support. "The thing that's been tough is making sure that he knows that I've appreciated his time in listening and providing feedback," Lin says. "Because we're so familiar, I think I'm liberal about taking advantage of his advice and probably taking things for granted." So at a recent dinner to celebrate the company's $5 million in Series A funding, Lin made sure to thank her husband during a congratulatory speech. 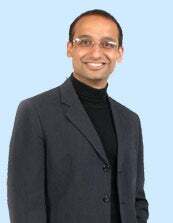 MySkin cofounder Rahul Mehendale. 36, can easily get caught up in the day-to-day management of his three-year-old website, his four employees in New York and the more than 30 contractors he uses around the world. So he often turns to his wife Aarti when he needs a fresh perspective. She can see the big picture and consider the company's long-term goals, Mehendale says. "She is not tied into the ideas and can give very candid feedback without getting carried away by the coolness of the technology or the idea." He has learned to push back sometimes, though, because Aarti's risk tolerance is low. "For example, we had a concept called The Journal where people could take notes [about their skin online], and while it didn't appeal to her in its initial drafts, she has started seeing how it can apply," he says. "I make sure that she is not the only validating perspective." Aarti, 31, advises her husband about his leadership style, often giving feedback on the authenticity of his presentations and other communications. Recently, she helped Mehendale simplify presentations to the board of directors to convey information more clearly to people who aren't involved in day-to-day matters. "This outsider perspective," he says, "has been crucial." Aarti also helps her husband cope with stress and achieve work-life balance. "It's important to be able to pull the spouse away into [social] activities," she says.